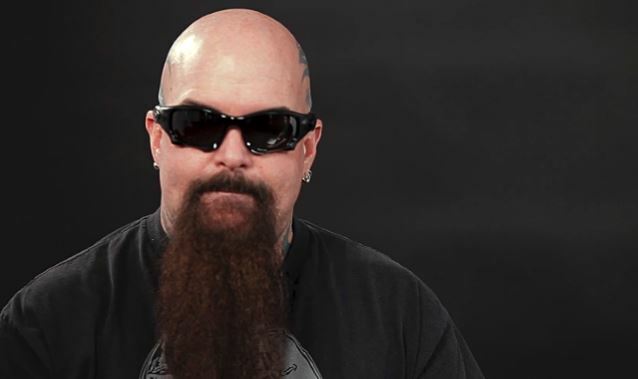 MetalRockNews: Slayer's Kerry King: "I'm still putting out a product that looks and sounds great"
Slayer's Kerry King: "I'm still putting out a product that looks and sounds great"
Slayer guitarist Kerry King was recently interviewed by Las Vegas Magazine, you can read some excerpts below. About if the band could have survived something like the death of co-founding guitarist Jeff Hanneman ten or twenty years ago. "It's hard to say. This situation that we're in right now, everything just fell into place. In the face of tragedy, we just moved forward and it happened to work. I'm sure there are scenarios that could have come up where it didn't work. We powered through it, and we're a strong band now because of it. Playing live … it's tight, it sounds good. That's my biggest concern, we're super tight. Like I said earlier, to have my booking agent say it's one of the best shows he's ever seen, that says I'm doing something right." About continuing to record and play Slayer music live after passing the half-century mark, he said: "The funny thing for me, I think a 50-year-old when I was 20 is far different than a 50-year-old today. And it's not just because I'm 50. I think the times are very different. I can reflect on my parents because I was close to that. The lifestyle was so much more sedentary. There was watching TV and going to work; that was about it. I'm 50 now and I'm a far shot from the way my dad was when he was 50. Not only the perception is different, but I think lifestyle in general changes, and I think a 50-year-old is far more fit than they were 30 years ago. If you asked me when I was 20 if I'd still be playing when I was 50, I'd say absolutely not, but now here I am doing it at 51 and I feel great so far. I'm still putting out a product that looks and sounds great. Will I be playing when I'm 60? I don't know. Can't guarantee you. [Laughs] I don't know."